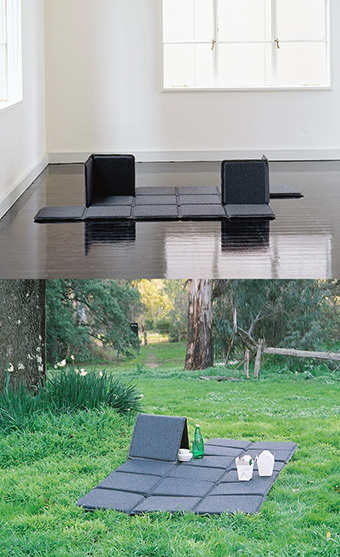 Floorplay was designed with portability and simplicity in mind. It consists of a grid of squares, fold lines, and slits enabling it to be easily folded into a variety of low forms. Floorplay is suitable for all ages: a portable, clean surface for new borns and crawling legs, an engaging object for curious 4 going on 10 year olds, a comfortable headrest for resting or a visor for picnics in the park. Floorplay’s simple, no fuss aesthetic enables it to form part of any decor. When not being used, it can be easily folded and stored away. Floorplay has received tremendous recognition both in Australia and overseas, especially following the prestigious Milan Furniture Fair 2004. 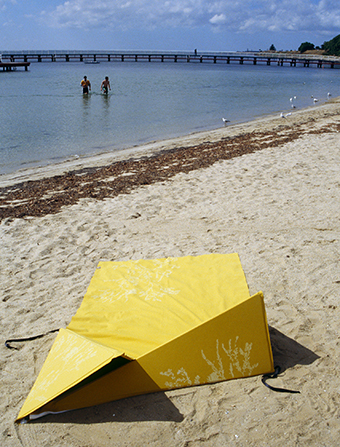 Beachboard was designed by Sam to provide a convenient alternative to traditional beach towel. The headrest, with integrated structure, is ideal for reading on the beach. The structure also helps to delineate personal space and offers some privacy from passer-bys. The fins offers a safe, shaded place to hide drinks, valuables and belongings. Beachboard is reminiscent of Australia’s beach culture; surfing, colour, fauna (eg shark fins), flora (eg tea tree foliage), cliff topography, sand landscapes (castles and dunes) and the play of shadows.